West Country locals are often portrayed as warm, welcoming and easy going folk and so have earned a good reputation among tourists. Their culture, religious obsession, folk songs, farm produces attracts the tourist who can share these interests with their friends and relatives. The West Country is blessed with large agricultural valleys that have rolling hills, beautiful beaches, and miles of luscious green countryside that make the landscape a perfect place for nature lovers and amazing outdoor activities. The West Country offers a wide range of activities to tourists; some of the main attractions are walking, surfing, sailing and cycling. There are guided walking tracks along the amazing green fields that enable you to enjoy the wildlife, heritage and the natural beauty of the land. Bath, Cotswolds, Exmoor, Somerset are well suited for cyclists and walkers as they offer different kinds of landscape. 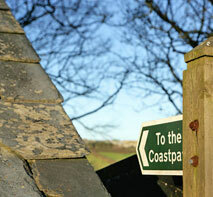 Some of the best walking tours cover England’s scenery, seascapes, grand cliffs and moor lands. Some self guided tours start from Minehead in Somerset to Poole in Dorset, Devon coast to coast, Coleridge Way, the Tarka trail that starts at Barnstaple in North Devon through Exmoor and the Spectacular North Devon Coast. People looking for special activities like rock climbing, canoeing, archery, sailing, surfing can also satisfy their desires. Water rafting trips are best run during the months of October till March. High rope courses are offered by various outdoor centres that provide all the essential equipment as well as guidance to inspire adults and motivate children to have some fun while outdoor learning. At Wimbleball Lake on Exmoor you can enjoy various kinds of water sports that include water skiing, windsurfing and canoeing. There are also lakes that offer great fishing options. Cornwall- Blue Reef Aquarium, Cornish Birds of Prey Centre, Newquay Zoo, BF Adventure Centre, Siblyback Lake Country park, various Surf schools, Treasure Trails, Cornish Cycle tours, Outdoor Adventure, Adventure Clydesdale Horses, Nature Workshops, Holywell Bay fun park, Flambards, Poldark Mine, Eden Project, Dairyland Farm world, Healeys Cornish Cyder farm. Devon- Paignton Zoo, National Marine Aquarium, Bygones Victorian Street, Go Ape, Woodlands Leisure Park, Pennywell Farm, House of Marbles, Miniature Pony centre, Abbotshood Cycle Hire, Exeter Medieval Trail , Land rover Experience West Country, Exeter Red coat Guided Tours, Clip 'n' Climb, Diggerland, Seaton Tramway, The Donkey Sanctuary, Exeter's Underground Passages. Wiltshire- Longleat Safari Park, Bush Farm Bison Centre, Wilton Windmill, Swindon Designer Outlet, Salisbury Racecourse, Salisbury city guides, Old Sarum, Rockbourne Roman Villa, Salisbury Cathedral and Magna Carta, Ballooning Network Ltd, Peddles and Paddles, Groveley Riding Centre. Gloucestershire- Cotswolds Falconry Centre, Cotswold Farm Park, Dean Forest Railway, Sudeley Castle, Gloucester Cathedral, St Augustines Farm, Ballooning in the Cotswolds, Cheltenham Racecourse, Xperience Archery, Pitville Pump room, Holst Birthplace museum, Bancroft river trips, Shipton Golf club, Airtopia Paragliding Centre, Cotswold helicopters,Pick a pot and Paint. Dorset- Thomas Hardye leisure centre, Adventure Voyages, Gorcombe Extreme Sports, West Dorset Walks, Weymouth Walk, Cyclexperience, Burngate Stone Carving centre, Frome Valley trail, Jurassic Safari, Studland Stables, Land and Wave, The Clay Studio,Extreme Coasteering, Mackerel Fishing, Avon Beach, Woodberry down Activity Centre, Jane Austen Walking tours. Somerset- Exmoor Pony centre, Red stag Safaris, Seaquarium, Burcott Mill, Willows and Wetlands Ride, Sheppys cider museum,Montacute TV, Radio and Toy Museum, Cannington Golf club, Dunster Tall Trees Trail, Backwell Leisure centre, Wookey hole caves and Papermill, Ham hill Country park, Cheddar Caves and Gorge. After a warm spell earlier this month, cold winds have returned with showers of hail . There is talk of extensive draught which has not yet marred the beauty of bluebells. Bluebells all over the country are blooming earlier than usual. Time to get out into the woodlands in the West Country and enjoy the scent and fabulous blue haze of bluebells carpeting the woods. Rent a cottage for a short break and make a holiday of the occasion. The West Country is the best place to be in England in late May. 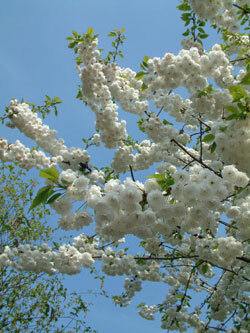 Every fruit tree in the area has boughs heavily laden with pink and white blossom. Each bush and tree is in its glory at its most beautiful.